Paul is very efficient and helpful. We needed a transport from our hotel to airport, and i only manage to approach him in less than an hour that we needed the car. Although we can get a cab easily, but the cost will be much higher, therefore, I decided to try my luck and see if Paul is able to help. To my surprise, he manage to find us a car within 30 mins and arrived on time to pick us up from hotel to airport with much lower cost compare to cab. A thumbs up for his fast service. Thank you. We are a Singapore family of 5 who knew Paul from friend’s recommendation. 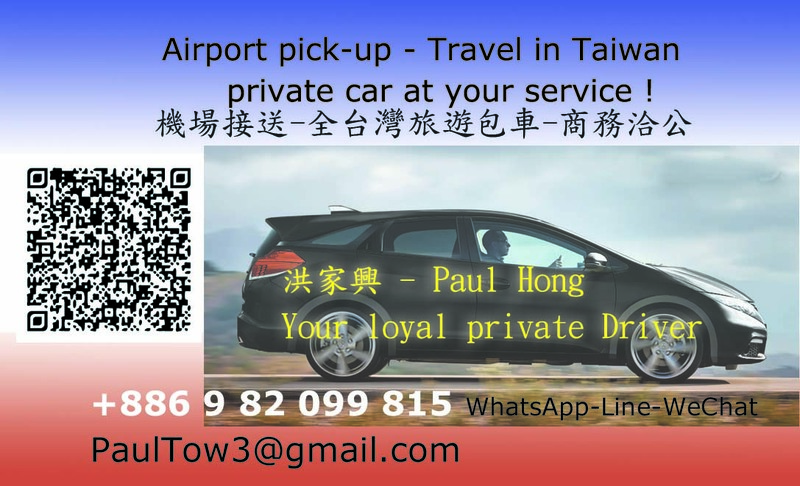 Very helpful and friendly guy who always has a smile on his face 🙂 Clean car with reasonable pricing, we will definitely look for him the next time we visit Taiwan! We engaged Mr Hong through a mutual friend’s recommendations and we had no regrets engaging him. Mr Hong was very friendly and helpful in helping to plan our itinerary before we went to Taipei. Charges for his services are very reasonable and we had an enjoyable trip under his recommendations. Paul is such an awesome guy! Really kind and patient with my never-ending queries, he basically helped to plan my 3 week trip in taiwan though we only hired him for a few days. He gave us so much good advice and brought us to locals fav fun spots. Prompt communication, punctual and reliable, he will definitely make your trip a more stress free and enjoyable one!